Since 1966, Camping World has been the number one choice of outdoor enthusiasts for camping and RV accessories and equipment. RV supplies - From tire covers to cleaning supplies and bike racks, they have all the RV supplies you need to keep your RV looking great and running smoothly. Check out their catalog or website for information about replacement RV trailer parts. RV appliances - Outfit your new RV or equip a new one with the best names in RV equipment and appliances. From stoves and dishwashers to furnaces and water heaters, they carry the appliances RV owners need to make their home on wheels comfortable and efficient. Bedding and mattresses - You'll never want to stay in a hotel again when you try the comfort of an RV mattress from Sleep Number. Or choose a pillow-top mattress with Visco-elastic Memory Foam built in for resilient comfort night after night. Top your bed with a warming mattress pad and one of their all in one bedding sets for quick set up and soothing comfort. Exterior RV camping accessories - Relax and enjoy your evenings at the campground with exterior awnings, portable patio shelters and ground-leveling RV mats. Add colorful bug-repellent candles, a holographic flag, and outdoor lights to add a decorative touch to your RV space. Camping equipment - Spend your nights under the stars in cozy sleeping bags, with all the gear you need for a great camping trip. Choose the right tent for your family, then add Coleman lanterns, stoves, coolers and other camping supplies. Keep a set of camping gear in your camping trailers for nights when the stars are just too beautiful to sleep indoors. 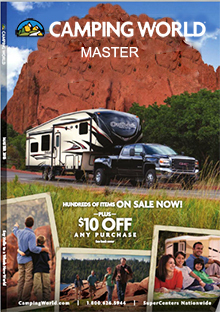 From the best names in RV furniture and RV appliances to reliable camping supplies, let Camping World put their 40 years of experience to work for you to make your next RV or camping trip the best ever.